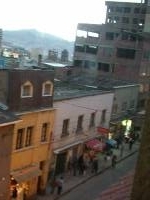 Blog from La Paz, Bolivia | Where is the Love? Well, now we know why Bolivians have no teeth. They get the bus from Uyuni to La Paz. 9 hours of rattling dirt track followed by a smooth last hour, from 6am to 7am, as we approached the largest city in Bolivia for our 2 night stay at hotel Rosario. We were obviously tired on arrival but gathered ourselves for a walk around the city of La Paz. 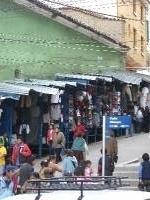 The main city in Bolivia is full of traffic and market stalls selling all sorts of things but as you have seen from the photos mainly Llama hats. The most interesting of markets was the Mercado de Hechiceria or the witches market. Some interesting lotions on potions on these stalls not least the preserved Llama foetus (good luck to bury under a new house) or cannabis incense. We explored the main square and main streets and saw all the citiy´s churches and landmarks. All a bit old hat by now so we decided to book ourselves on a cycle down the "Death Road" the following day. After a fine Indian dinner and saying goodbye to our tour guide Sara we went to bed early to prepare. The Death Road links La Paz with Coroico. 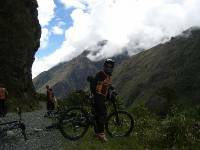 A rough narrow track chiselled out of the mountain side it descends more than 3,500m during the 64km cycle. It used to be the main road connecting the two towns. It was during this time it acquired its name when trucks slid off the side while trying to pass each other and hundreds died each year. 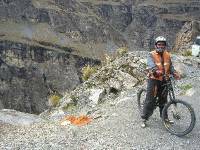 Now a new tarmac road has been constructed and the Death Road is used primarily for mountain bikes. We got our bmx helmets, trousers, gloves and satin leggings all still fresh with yesterday´s group´s sweat and headed off in our bus up into the Andes. We reached the highest point and the large group of us, about 40, were all fitted with our bikes. To be fair I was quite surprised, the bikes were top quality and clearly cost more than any car we had laid eyes on in Bolivia, a big relief. The 64km cycle we were informed includes the first 15km on the new tarmac road before we turn off onto the Death Road for the final 49km. The tarmac section was exhilarating. We were travelling at great speed overtaking lorries through some of the finest scenery you could hope to lay eyes on. The only way we could think to describe it was Glencoe multiplied by 1000, fantastic. The wind was taken out of our sails when we hit a 500m uphill section. 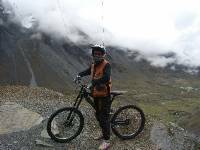 Not pleasant in the altitude but the Loves to their credit remained on the saddle throughout. More can be said for several of the others. Shortly after this section we came to the start of the Death Road and were split up into three smaller groups. The road was a bit of a dirt track and the drops were sheer, the guide suggested that in some places the drop was 1000m. When on the bike you soon forgot about the drop on the left and picked up speed. This was not the case for some of the group however who were a little nervous, and slow. It was a great experience though and not as scary as the tour guide made it sound. The scenery was absolutely fantastic and it was a treat to cycle 64km and only have to peddle for 500m. That didn´t mean we did not deserve the large bottle of beer on reaching the bottom however. Back in La Paz and all decked out in our new "we survuved the death road" t-shirts we headed to the hard rock cafe for dinner and drinks. 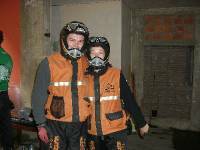 The guide book did say it was safer to try and blend in with the locals! It was the last night of the trip for some of our group so dinner and several cocktails were sampled. In typical Bolivian tradition the entire bill was no more than 10 pounds each. It really will be a shame to leave this country. This rounded off a great day. The next moring was not soo clever however as we got the 7.30 am bus to Lake Titicaca.